Need base station antennas? We’ve got ’em at Solid Signal! This is an antenna. For most of you, it may not be interesting. You may not even realize it’s an antenna when you look at it. But yes, it’s an antenna. 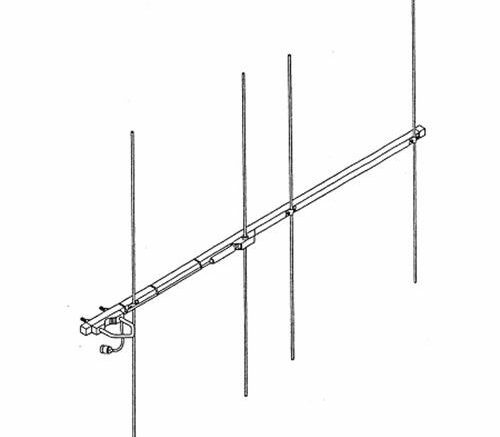 This particular antenna specializes in picking up frequencies from 165-174 megahertz, which is right in the middle of the VHF television band. It’s actually used for first-responder radios and other really specialized reception, so it’s the sort of thing you’d find on a tower attached to your local TV station. It’s probably not the sort of thing that you’re sitting in your home just wishing someone would give you as a present. However, if you’re in the market for this antenna or literally any other sort of specialty antenna, you’ll find the best selection at Solid Signal. We have antennas that pick up everything from .5MHz to 28,000MHz, from local walkie-talkie traffic to signals from the furthest reaches of space. Whether you’re a first-responder, a business operator, a financial whiz, or a home theater buff, you’ll get the antenna you need at Solid Signal. The easiest way to find the antenna you want out of the extraordinary selection we have is to search for the frequency range you need. In general this is dictated by the kind of radio or TV signal you want, although the most popular categories (TV antennas and satellite dishes) have their own categories. You can usually find the frequency range either on the radio or TV receiver itself or in the owners’ manual or online documentation. If you’re still not sure, give our technicians a call at 877.312.4547 and we’ll work with you to find the information you need and the best antenna for your specific application. Can I get local channels in my yacht? How would you like to get all the best channels for free?